When I first bought these packs I honest didn’t think the rolls would be as giant as they were, but trust me when I say this pack will last your family a long time! 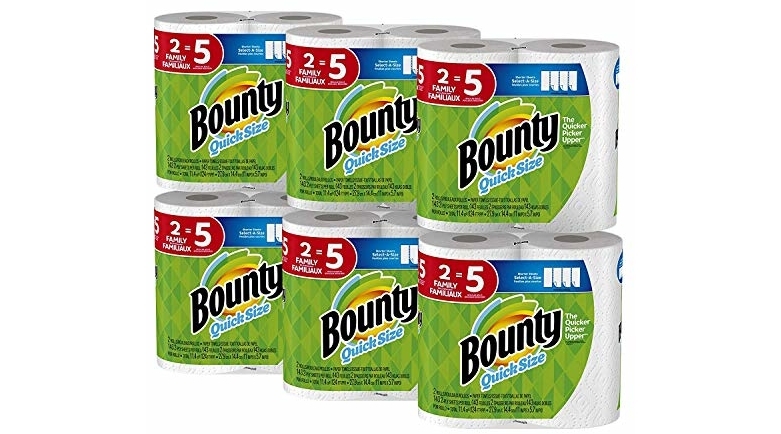 This morning I spotted a pretty sweet bargain on the high popular Bounty Quick-Size Paper Towels, White, Family Rolls, 12 Count (Equal to 30 Regular Rolls). The price is currently $30.44 but when you click to instantly clip the $3.00 off coupon, the price at checkout drops to just $27.44! Grab an even sweeter discount and save up to an extra 15% off when you Subscribe & Save making the price as low as just $22.88! That works out to 76¢/equivalent regular roll since this giant pack works out to the same as 30 regular rolls.